Excluding corporations, companies older than 1990, and multinational companies, there are approximately 10,380 employees working in the 519 tech startups and scaleups. ICT is the largest sector with almost 24% of these employees. Lifestyle (19%) and Media & Communication (19%) are the second- and third-highest employing tech sectors. Startups represent 92.7% of Rotterdam’s tech companies but employ only 34.7% of workers, with just over 3,600 startup employees. 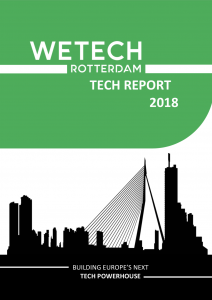 Scaleups, in turn, may only represent only 7.3% of tech companies, but account for 65.2% of the jobs in Rotterdam-based tech companies, employing almost 6,800 workers. Rotterdam has 60% as many tech companies as Amsterdam (excl. corporates and foreign multinationals), but these companies employ only 31% as many people. This points to a lesser rate of Rotterdam companies that manage to successfully scale their company from a startup to a scaleup. The EVR (Economische Verkenning Rotterdam) reported some 365,000 employees in Rotterdam in 2017.10 As such, the tech startup sector makes up approximately 3% of the region’s full employment. The 10,400 jobs in tech startups and scaleups coincide roughly with EVR’s 12,084 employees working in the “Information sector”. The disparity is due to differences in methodology and company selection (e.g. inclusion of corporates and multinationals). The EVR suggests that these jobs have grown yearly by 8.9% between 2014 and 2017. EVR data also suggests that there are approximately 3,600 ICT vacancies, growing at 12% each year on average since 2013. By definition, an increase in open vacancies at any time implies a growing struggle to find the necessary talent. As presented in the Tech Education chapter, Rotterdam and Delft combined award 6,200 STEM diplomas each year. Just over 2,200 of these are in technology fields.5;6 While the retention rate of graduates is not known, even a hypothetical (and far too optimistic) retention of 100% would still leave Rotterdam with a tech significant talent deficit. This deficit will keep growing in the future. STEM enrolment is growing at 7.5%, while ICT vacancies are growing 12% annually. The disparity between this vacancy growth and realized employment growth (8.9%) further suggests that companies fail to grow as desired due to lacking tech talent.